"[Amy] tends to strategize with us from a business angle, blending her knowledge of the law with the business." Amy Traub is an experienced employment litigator and adviser, focusing her practice on the management side of employment law matters for clients in all industries, with a particular focus on the health care and retail industries. She informs her clients of the risks involved in a particular situation and, ever mindful of business practicalities, ensures that the resolutions she proposes accommodate the inner workings of her clients' businesses. Amy is the national leader of the firm's Employment Group, and co-leader of the national Wage and Hour team. 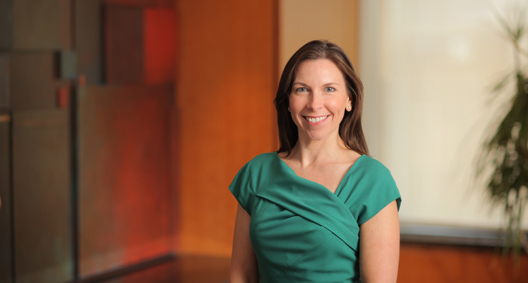 Amy is ranked in Chambers USA: America's Leading Lawyers for Business as a leader in the field of Labor and Employment, where she has been described as being "very good at seeing all sides of things and discussing the risks in a way that is very easy for someone who's not a lawyer to understand" (Chambers USA 2015). Amy is also recognized as a New York Metro Area "Super Lawyer." Provides ongoing advice and counsel to companies of all sizes. Advises chief executives, human resources and legal departments on all aspects of the employer-employee relationship, including discrimination; harassment; retaliation; leaves of absence; religious and disability accommodations; background check processes and forms; and compliance with employment laws. Counsels clients on termination and restructuring efforts, including New York WARN Act compliance and related issues. Counsels clients related to federal and state wage and hour concerns, including misclassification of employees; meal and rest periods; off-the-clock work; interns; rounding practices; tip pools; and other wage laws. Conducts wage and hour audits for clients across variety of industries, including healthcare, hospitality and retail. Serves as designated outside employment law counsel for a number of clients with respect to federal, state and city agency complaints, and federal and state lawsuits involving all manner of employment disputes. Successfully represented a hospital employer in a federal lawsuit brought by a former employee concerning the classification of the employee's position, obtaining summary judgment. Works with human resources, legal and compliance departments to ensure compliance with employment policies and procedures. Prepares and modifies employee handbooks and policies, and drafts and negotiates employment, separation and restrictive covenant agreements. Trains managers, employees, human resources professionals and members of legal departments on employment laws and requirements. Conducts audits of human resources policies, practices and procedures. Successfully defeated federal disability discrimination litigation involving the Family and Medical Leave Act. Successfully defended a staffing company against charges brought by the Equal Employment Opportunity Commission (EEOC) regarding concerns of discrimination. Successfully represented multiple international retailers in putative nationwide collective wage and hour actions, in which salaried store managers alleged they were misclassified as exempt. Representing multiple clients in a variety of industries in federal and state putative class action lawsuits alleging numerous wage and hour violations. Successfully defeated contract claims by a former employee of a religious organization on the basis of the ministerial exception in a matter of first impression case in the Supreme Court of the State of New York. Lead counsel for a health plan provider in connection with a religious discrimination enforcement action brought by the EEOC on behalf of former employees. Representing a health company in a case of first impression regarding alleged religious discrimination centering on a voluntary communications program offered in the workplace. Represented a major food company in a Fair Credit Reporting Act putative class action case, successfully obtaining dismissal of all claims. Successfully mediates and negotiates settlements in a wide variety of single-plaintiff and class action cases. Representing large hospital system in connection with 19 cases filed against it pertaining to mandatory vaccine requirements. Reminder: Beginning July 18, NYC Employers Are Required to Accommodate "Personal Events"
California Employers, Look What 2014 Has In Store for You!